Created at the height of Auguste Rodin’s passionate love affair with the young Camille Claudel, L’Eternel Printemps is one of the French sculptor’s most highly acclaimed works. It will lead Bonhams’ Impressionist and Modern Art sale on 4 February at Bonhams New Bond Street with an estimate of £500,000-700,000. L’Eternel Printemps’s raw physicality marks a shift in Rodin’s œuvre from classical, allegorical depictions of love, to more sensual, human representations. He declared in the 1880s: “there is nothing in Nature that has more character that the human body” and encouraged his models to adopt their own poses for L’Eternel Printemps. Well ahead of its time, the sculpture’s earthly spontaneity had to be exhibited initially under chaste mythological titles, such as Zéphyr et la Terre and Cupidon et Psyché, as a nod to social propriety. Yet Rodin was not approved of everywhere and in 1886 The Times published a negative review of his work. Robert Louis Stevenson, author of Treasure Island and Rodin’s close friend, publically rose to his defence. As a gesture of gratitude, Rodin gave him a plaster model of L’Eternel Printemps, which Stevenson took with him on his travels around Europe. 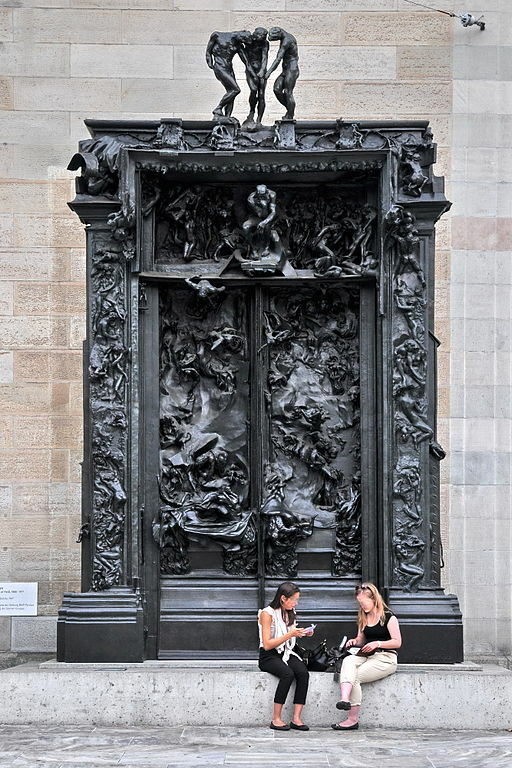 It is thought the sculpture was first intended for La Porte de l’Enfer (The Gates of Hell), the monumental sculptural group on display at the Musée d’Orsay. Commissioned in 1880 by the Directorate of Fine Arts in Paris, Rodin worked on La Porte de l’Enfer for the last 37 years of his life. Early photographs show L’Eternel Printemps positioned in front of the frame for the gates, a compositional idea reflected in Rodin’s original preoccupation with the front view of the piece. It was perhaps the associations with Claudel and the overt joyousness of the lovers in L’Eternel Printemps that prevented the sculpture’s inclusion in the larger work. The present lot is the largest bronze reduction of L’Eternel Printemps. Measuring 66cm high, it was cast in Rodin’s lifetime between 1905 and 1907. A bronze sculpture of the first state of the work is in the collection at the Musée Rodin in Paris, which reopened in November after significant renovation.